Made from Genuine and Natural Brazilian Agate Blue Laguna Geodite Slice Gemstone. Each Crystal is Handcrafted and Naturally Unique and no two pieces are ever alike. Each Geodite Slice Pendant is One of the Kind. Gemstone Size: Approximately 1 ½ inch. 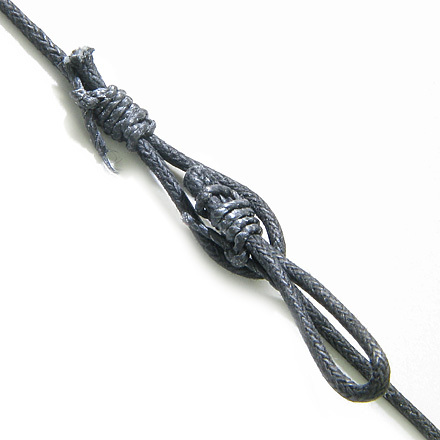 Comes with 24 inch Cotton Cord necklace and has Loop to Loop easy to use cotton buckle. This is Naturally Unique and One of the Kind Geodite Slice Charm pendant made from Agate Blue Laguna Crystal Gemstone. This Geodite Slice Pendant is made from Genuine Gemstone and may have natural specks. It has Silver Electroplated Bail and tied to Cotton Cord and looks absolutely Gorgeous. These Crystals are Handcrafted from Brazilian Gemstones and made exclusively for Best Amulets. This Crystal is Good Luck Amulet, as it is made from Agate Gemstone and attracts powers of Good Luck Energies and Forces. Stay Lucky and Unique with your Own Individual Crystal Amulet. Agate known as a Good Luck stone. It Brings Peace and Happiness. Agate is a Protective stone. Its protective energies are more gentle and subtle than some stones. It can be particularly effective when calling upon Angels for protection. Inspiration is another hallmark of blue lace agate and that can assist in inner attunement, and has been said to be useful for performing Miracles. As well it balances Yin-Yang energy. It can help bring stronger intuition and inner knowing. 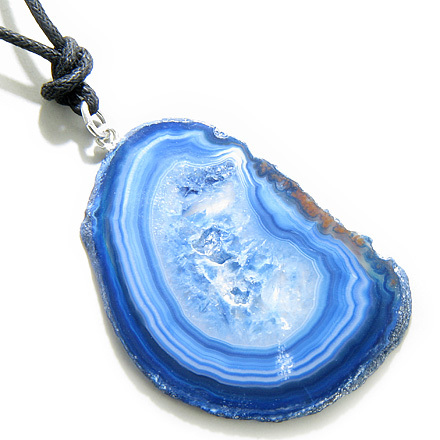 Blue lace agate is considered a stone of communication. Agates have long been thought Magical, curing everything from thirst, the evil-eye and bad dreams. Agate foster Good Luck, Love, truthfulness, courage, bravery, strength, abundance, wealth, longevity, acceptance, protection, balance, harmony, generosity, security, Persuasiveness, agreeability, congeniality, compatibility, creativity, acquiring wealth. Agate is believed to discern truth, accept circumstances, and is a powerful emotional healer. Legend says that Agate improves memory and concentration, increases stamina and encourages honesty. Agate insures pleasant dreams, to enhance personal courage and protect one against danger. It also provides security and appreciation of nature. Agates are considered Power Stones. Agates have excellent protective and healing energy, and stimulate analytical capabilities and precision. Agate crystal on your desk will help you be more precise. Also helps awaken (discover) your inherent natural talents. Agate is an Earth Stone, which the ancients believed were among the most powerful of medicines. As well it Improves self-esteem. Agate is said to assist in finding hidden treasure, and is a stone of prosperity.